I absolutely loved John Stonestreet’s commentary A Private Little Faith, Oct. 10th 2012, at Breakpoint.org1. Concerning the new Pew Survey on Religion, he spoke of the group who have no religion at all as The Nones and those who say they are believers in Christ but have zero church affiliation as the Just-Me-and-Jesus crowd. This research revelation has been coming for years. However it may be surprising to many because the majority of Christians do not share their faith… so how would they know? 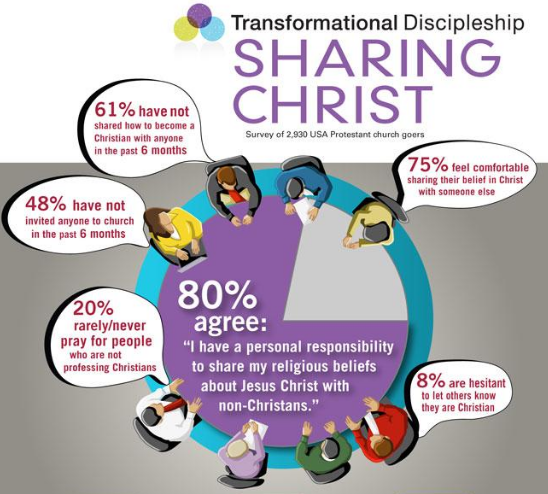 According to the August 15th article in the Christian Post titled, Churchgoers Say Sharing Faith Essential, Many Never Do, a Lifeway Research poll indicated that only 25% of Christians have shared their faith in the past 6 months!2 That is one out of four people. So the majority of believers do nothing with the gospel except sit on it. Is it any wonder there is a big deal being made about the Pew research poll? But I am digressing, the point I want to discuss is the two groups in the title, the Nones and the Me, Myself, and Jesus crowds. For years I have heard the excuse from both of these groups that I do not need the church; I do not need other Christians in my life. The Nones are those who do not think much about an afterlife. When they do they come up with a myriad of excuses as to why they either do not believe in one or they hold to the concept of annihilation; the belief that when one dies they completely die—body, soul, and spirit. No judgment, no hell, no nothing—it’s as if they never existed. The Me, Myself, and Jesus crowd believe they have Jesus figured out. In their arrogance they build themselves up to actually believe they can impose upon God their own system of morality and worldview. They believe that their customized Jesus and customized heaven is the same as the Jesus of the Bible and that He is obligated to oblige their belief. In both cases we have what the Scripture calls idolatry or the worship of something other than or above and before the God of the Bible. The first commandment written in the Bible states, “You shall have no other gods before me,” Exodus. 20:3, Deut. 5:7. In this case they worship their intellect or their self—what they conjure up in their own imagination about God and believe to be truth. So upon this floating island of self that moves wherever they move they have perfectly enshrined themselves as a god. The creation has triumphed over the authoritative Creator—the creation has made its Creator subservient to them! But again, I digress. Scripturally speaking, I have already judged these groups as desperately lacking knowledge of the Scripture therefore destitute of what the Bible clearly reveals about Truth, God, Heaven and who Jesus is—men and women sliding headlong into Hell’s fury. It is clear in Scripture that this is the attitude that unbelievers possess, “What is revealed is God's anger from heaven against all the godlessness and wickedness of people who in their wickedness keep suppressing the truth;” Rom 1:18 CJB (Complete Jewish Bible). The Nones by their own admission do not submit to the Scripture but the Me, Myself, and Jesus crowd are the ones who are even more deceived. They have either conjured their Jesus from a scant knowledge of Scripture or the word-on-the-street—the street Jesus; the Jesus the world wants not the Jesus the Bible reveals. In the 21st century evangelism will have to take a new direction. We cannot rely on past seed plantings ready for the water of the word that God may give growth, 1 Cor. 3:6. No, in the 21st century evangelism will have to start with pioneer work. We will have to plow the ground and plant the seeds. We will need to study up on 1st century evangelistic technique and begin again to model the work of the harvest after the original pioneers of the faith. Persecution? Yes. Hard work? Yes. One-on-one mentoring and teaching? Yes. Private meetings? Yes. Never giving up? Yes again. True believers know that to follow Christ means above all, taking Luke 9:23 to heart; “Then He said to them all, “If anyone desires to come after Me, let him deny himself, and take up his cross daily, and follow Me.” Following Jesus means hearing Jesus’ words; which means reading what He has revealed in Scripture about Himself, and adhering to it in full submission. Making our own Jesus, our own Heaven, and our own God will never lift our soul one millimeter off this earth when we die. But it is a surefire way to sink it into the abode of the fallen angels. May God in His grace open their eyes and soften their hearts; May He by His Spirit call them to Him and may we by the conviction, direction and empowerment of God’s Word and the Holy Spirit intentionally take the gospel to them. Powerful message, brother Mike! You are correct because we're back to the Pioneer phase where we do have to plow, plant and water the seed all at the same time...seeing the number of workers are so small! The problem is- how many people sitting in churches these days are the "nones"!!! Sad, bro...so sad...let's kick it up a notch...week after week! WOOHOO! !